Flashcards are a popular way to study. There are various ways to use them, for subjects ranging from foreign language to science. Using flashcards to self-test helps you learn information, and also helps you to identify any weak spots you may have with the material. It is better to discover weaknesses while you are studying, when you can still improve on them, instead of when you are in the middle of a high-stakes test. One common criticism of flashcards is that they encourage students to “just memorize” information, instead of really understanding it. Here I will show you a few ways to use flashcards to add more variety to your understanding and learning of concepts. The key to implementing this strategy is to make one stack of concept cards, and a second stack of instructions. These instructions will guide you through exploring and understanding the concepts in new ways. Here's how! 1) Use your notes or your textbook to identify key concepts in the material. On one side of a flashcard, write the name of the concept. On the back of the flashcard, write the definition. Once you have made flashcards for all of your concepts, move on to step 2. 2) Make a stack of instruction flashcards that invite you to interact with and elaborate on these concepts. 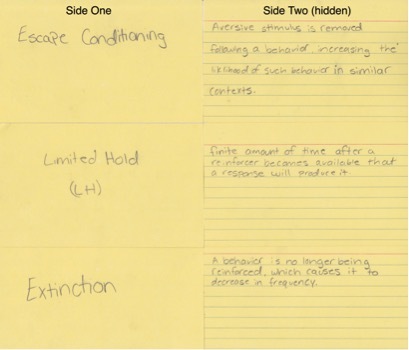 Use a different color flashcard or different color pen to keep these separate from your concept flashcards. Here’s a list of possible instructions to get you started, but each subject and topic will require slight tweaking of these instructions. Refer to this list of possible elaborative interrogations for ideas on how to fill this stack! How would you explain this to a child/someone who has never heard of it before? What situation in your life has depicted this concept? 3) Once you have two stacks of flashcards, you are ready to study! Shuffle both stacks, but keep them separate (color coordination of the flashcards is helpful). Select one card from each stack and follow the instructions in regards to the concept that you selected. It is important to write or say aloud your responses to ensure that you can formulate and execute an answer. 4) After you have gone through all of your concept cards, refer back to your notes or textbook for any concepts you had trouble with. Make sure you write or say aloud a correct answer about each concept before moving on. 5) Shuffle both stacks and repeat until you are ready to take a break. You can always come back to these cards for a quick study session by yourself or with a friend. Make a large stack of instructions and use them for different classes. Shuffle together multiple stacks of concept cards and study various subjects at once to take advantage of interleaving and build connections between topics. Switch instruction cards with a buddy and see how you do!